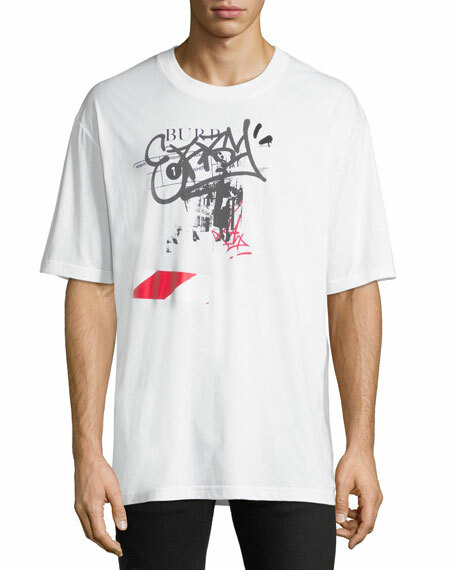 Burberry "Cordon" T-shirt with graffiti graphic front. Burberry "Jadford" T-shirt in cotton. Embroidered equestrian knight at chest. Rounded V neckline. Short sleeves. Straight hem. Pullover style. Imported. Burberry "Jadford" T-shirt in cotton. Embroidered equestrian knight at chest. Rounded V neckline. Short sleeves. Straight hem. Pullover style. Imported. Model's measurements: Height 6'1"/185cm, waist 32"/81cm, typically wears size M.
Burberry "Carlow" T-shirt with logo graphic. Crew neckline. Straight hem. Pullover style. Nylon. Imported. Model's measurements: Height 6'1"/185cm, waist 32"/81cm, typically wears size M.
Burberry "Cruise" T-shirt with front print graphic. Crew neckline. Short sleeves. Pullover style. Cotton. Machine wash. Imported. 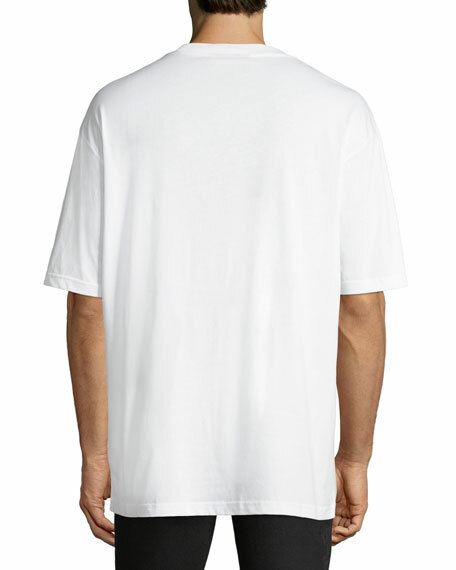 Burberry "Cruise Abtot" T-shirt with front print graphic design. Crew neckline. Short sleeves. Pullover style. Fitted. Cotton. Imported.